One of my son’s favorite things is being a cub scout. And while I’m super proud of this fact, It’s a little daunting as it involves a lot of involvement! However this weeks task was right up my alley. Teddy was also super excited as it included sugar! 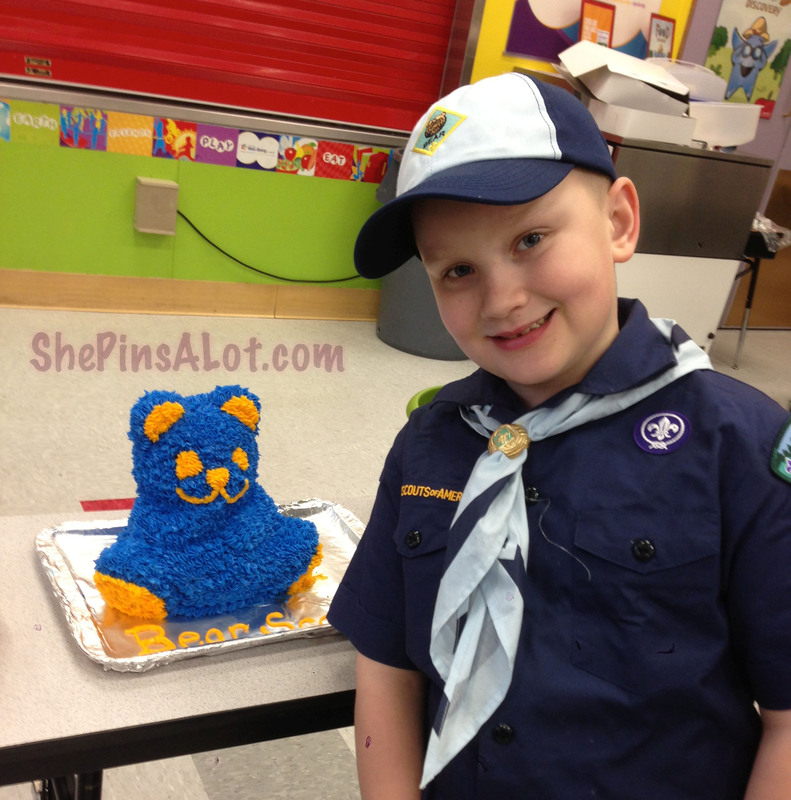 The challenge was to create a cake together using the scouting theme. So whats the first thing I do? Search Pinterest of course!! I currently have a Scouts board that you can check out where I saved all my ideas. This is a prime example of how I use Pinterest for inspiration. I love to take several ideas I find there and then squish them together to come up with something of my own. 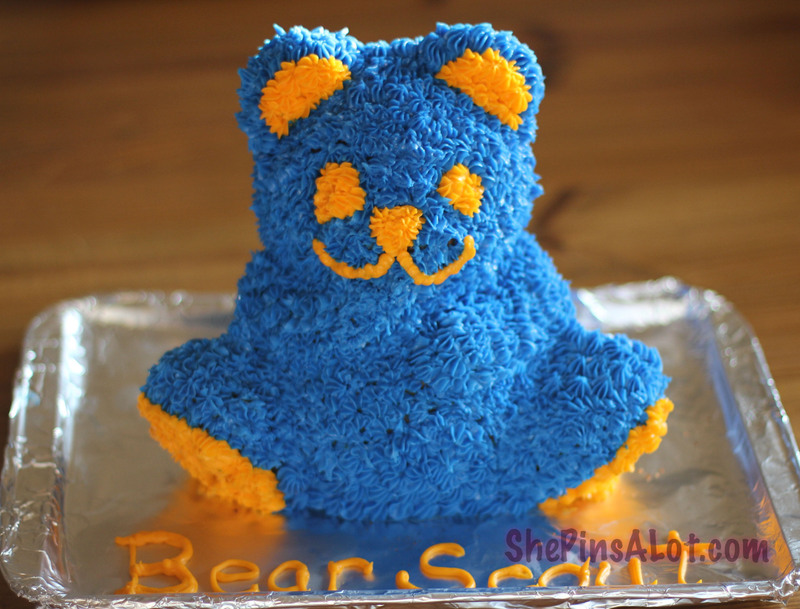 Teddy of course was my inspiration for this cake – which he totally loved as he is a Teddy. I originally had liked the idea of a paw pan using the colors of the blue and gold ( boy scouts colors ) and how they used the star tip for the icing. But I didn’t want to have to go buy a pan. Looking at the pans I already possess ( and there are a lot of them in my stash ) I saw my Wilton 3D pan sitting up on the shelf in the pantry! Teddy was thrilled! a 3D cake! That sounded good to him! Fortunatly I have a plethora of Wilton dyes in the stash as well. A quick trip to the store and we were on our way to our creation. The instructions for the pan advised using a heavier cake mix. 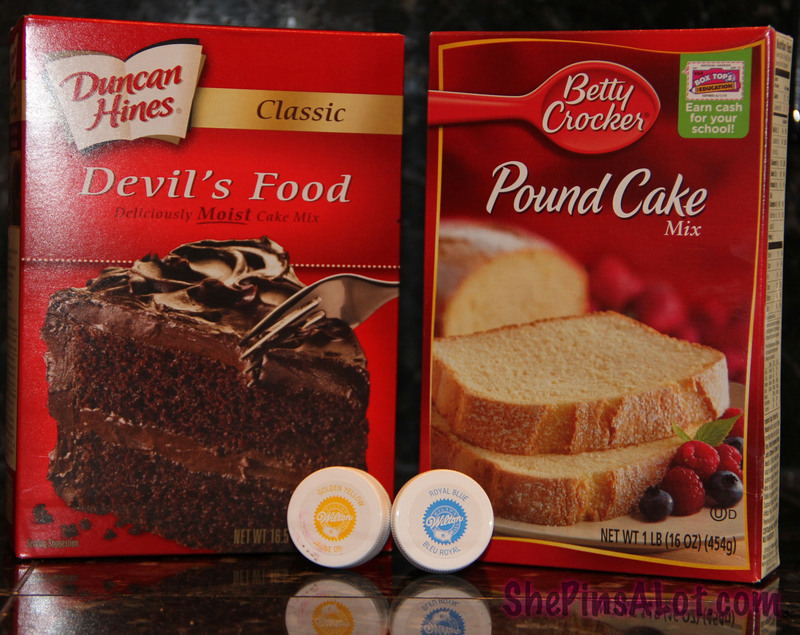 So per the instructions I picked up a pound cake mix and a devils food cake mix. These are the two cake mixes I purchased. 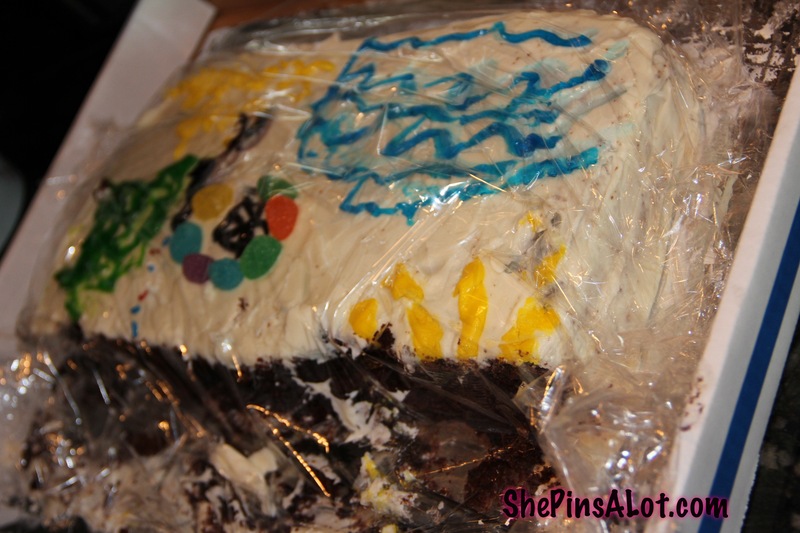 Those are the 2 colors of dye that I later used in the icing. Wilton’s gel dyes in golden-yellow and royal blue. I mixed the cake mixes up according to the instructions on their boxes. Then I gently swirled them together… or rather I dumped one in the same bowl as the other and sort of let them swirl together as I dumped the whole thing inside the pan. The 3D bear pan has a but plug insert. ( what else should I call it?!? ) 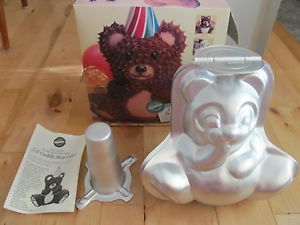 You fill part of the bottom insert thing about half full with the cake mix and then it gets inserted into the bottom of the bear. This whole cake pan gets held together with just clips. This here folks is the reason that you need a thicker cake mix. That pan will not be solidly closed. So as quick as you can, you fill the pan up, add the bottom insert thing filled with cake mix in the opening of it, have it sit upside down ( per the instructions ) on top of a pan to catch whats about to seep out, and shove that whole sucker in the pre heated oven at 350. This is of course the moment you realize that this cake pan is tall and you have to set it back down to take out one of the oven racks. Then you carefully place it into the oven and set your timer for 60 minutes. 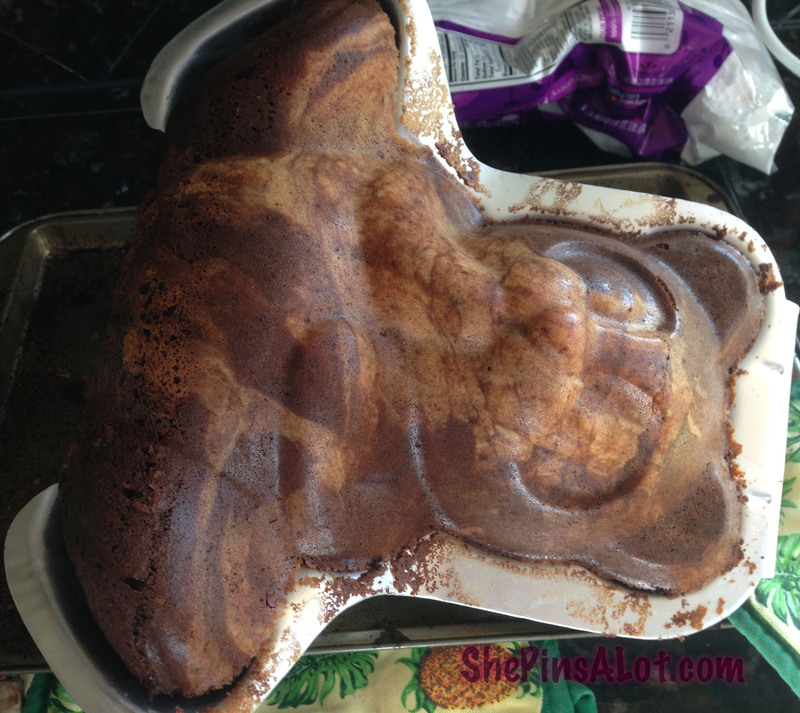 I forgot to add that I had a huge moment of OH sh#t as the two boxes of cake mix didn’t quite fill up the whole blasted bear pan. Have no fear – cake mix expands! And the bottom insert thing of cake mix also helped to fill it up. And this here is what it looks like when you take it out and open it up! It came out perfectly! It will take a bit of time to cool down. So while it cooled down, the son came home from school to step in and help out with the rest. He loves to help me. I love to let him clean up the vanilla he spilled all over the floor, my leg and my foot that didn’t quite make it into the icing as he was measuring it. He likes to help me smell nice. My icing is what my gramma taught my mom who taught me. Then add 2 lbs of powdered sugar. 2% milk added to desired consistency. food dye. An important note that I’ve learned about the hard way in the past – go less on the milk if you are adding dye as that will also change the consistency of your icing. Teddy learned a new vocabulary word – consistency. Now the fun part. 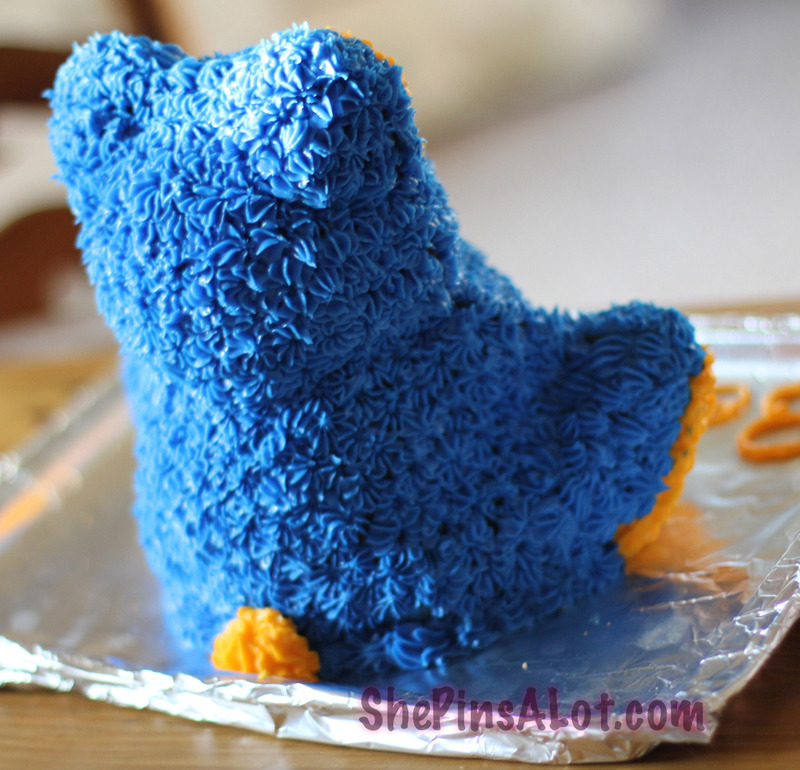 I used my Wilton piping bags and tips and we attempted to ice this baby up. Teddy was thrilled with the way the colors came out and even more thrilled at just eating the icing. Our scout troop had a great idea of doing a cake auction. The boys were given a bidding limit set by their parents and each cake went up for a live auction in front of the whole group. I think we had over 25 cakes total! And each one averaged about 15$ so this was a great fundraiser for our scouts. Teddy was so excited he bid early on and got the 3rd cake for 20$ I think he then learned a good lesson about how sometimes its better to wait a bit then to spend all your money right away. I think this was a really great lesson for all the boys over all on how bidding and auctions work. Our troop leader Melissa is just fantastic and she helped this whole thing go super smooth and the boys all had a blast! I almost didn’t get a picture of the cake teddy bid on – he liked it because the description said it was a triple chocolate. I liked it because I think this mom let her son do more of the work then Teddy’s did. We started eating it before I remembered to take a picture of it. Teddy requested the sunshine that was in the corner that is now missing. Julia ate the sprinkled clouds. I think the blue squiggles are a river and the gum drops are a fire pit. A lot of the cakes had awesome camping/nature scenes. We had a giant blue bear! All the cakes were really fun and this was a great event! Previous postDisney vacation countdown the sequel. Next postWhat is a Disney Fish Extender? This is so cute. I love the idea of a bear for the bear scouts and for Teddy! Triple whammy!